Alright ladies and gents, gather round and take a look at the hot new brew of competitive EDH! My name is Xuii2 (Altun7) andThis is my brain child into the format Blue Pod. Lerker has since joined the project and added a big spin of a wheel (all pun intended) to the list. We have started this up as BluePod (loosing the space in between) as what we are looking to make the Sans-Black deck of the format. BluePod is a creature combo deck that will play at a tempo pace throughout the game. Mana ramping into a card engine like Thrasios and holding up tempo plays is what we do until one of the other enablers is set up for the win. 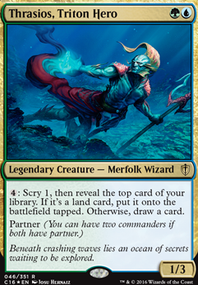 Thrasios, Triton Hero is the face of this relationship and is the "only" commander in the deck and is one of the main game plans. We have several ways to gain infinite mana and then will cast The Merman to draw our entire deck. With deck in hand we then begin chaining Timetwister and Noxious Revival to make sure we have proper colored mana to then end the game with either infinite damage or infinite creatures! Thrasios is also a card draw engine in here. 4 mana to activate the ability is really reasonable as is, but with Training Grounds and/or Biomancer's Familiar the cost only becomes one to two mana to use. With Seedborn Muse the engine revs up even more and is hard to beat. Bruse Tarl, Boorish Herder is a Yoked Ox and a meme of a card. 3/3 for 4 mana is pretty much pointless in the deck except for his colors. He is better than the other W/R partner for the fridge case you need a 4 drop to sacrifice to Birthing Pod, as Thrasios is already a two CMC creature. Another fringe line is casting him and getting in beats. This line is plan Z and should never need to happen. There are several creature combo lines available in our colors that will go infinite to end the game on the spot. The main infinite mana line I use in the list is low to the ground and is already included in our mana ramp section. This combo involves both of the cards listed in its name. Bloom Tender taps for 1 colored mana for each color permanent you control. Bloom Tender alone will tap for just a green, but if a blue permanent is in play will also tap for a green and a blue. Freed from the Real lets us untap enchanted creature for one blue mana. Bloom Tender will tap for GB and a B will be paid to untap infinitely resulting in infinite green mana and 1 blue mana! This combo works exactly the same as Bloom Tender and Freed from the Real. In order for the combo to work there needs to be a +1/+1 counter on the Incubation Druid; so it is a little harder to assemble, but if we get Druid off of card:Neofrom we are already ready to go. Not in List The combo works by having Devoted Druid in play (without summoning sickness) and then casting Vizier of Remedies . Devoted druid already taps for green and a -1/-1 counter can be put onto him to untap him and be activated again. Vizier of Remedies has a replacement affect that will subtract one -1/-1 counter when it would be put on the creature each time it would be place. The -1/-1 counter on Devoted Druid would be cancelled out as it would be placed on. Druid can now tap for green mana and be untapped for free resulting in infinite green mana! This Combo will make both infinite red mana and infinite Karmic Guide creatures with haste. Tap Kiki-Jiki to make a copy of Karmic Guide. Repeat the process netting 1 damage each loop until our opponents are all dead. This is a new combo that has been discovered in Blood Pod decks and transfers simply into our deck as well. As more people learn about the combo it may become harder to pull off, but both cards are still valuable on their own. Goblin Bombardment This is a new combo I was just exposed to and am looking to squeeze into the list as well. This combo initials two combos that I love. Infinite damage and infinite creature. The infinite creatures would be redundant with the infinite damage and is why I group it in the damage section and not the creature. Not in List Both of these cards deal damage when a creature enters play under your control. Both can be played in the deck as a wincon, but are redundant in how we kill. When we make infinite creatures (which we need to deal the infinite damage) we should have already won the game. If your meta is all Propaganda and Blind Obedience affects these cards may be things you want to consider to add to get around the effects. What is a red deck without Kiki-Jiki and infinite creatures? These combos are simple and easy to assemble off of tutors and our main wincon off of our Pod lines. This combo is so strong it has been banned out of the modern format. Having pestermite or one of the others in play and then casting Splinter Twin on them is the end of the game if not stopped. Splinter Twin give the creature it is attached to Kiki-Jiki’s ability to tap and make a copy of the creature it is attached to. The copies will untap the orginal to make more and they will swing with haste and the win. Not in List There are several instant and sorceries that will make a haste copy of a creature you control, but the main part of the combo is Dualcaster Mage. When the spell is cast targeting a creature you then hold priority and cast Dualcaster Mage. When Dualcaster Mage enters the battlefield he will copy a spell on the stack which will me the copy a creature spell and then will target Dualcaster Mage. The copy will then loop this and make infinite haste Dualcaster Mages. This combo is mana and spell reliant and hard to pull off. It is fun and cool when it works, but is hard to pull off. Stick to Kiki-Jiki. 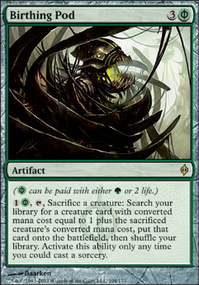 Birthing Pod is the name-say card in the deck and is the main line to victory in our list. Pod as value as both a way to enable our combos to win the game, but also a card that can pull out the cards we need to protect our self from losing the game. Pulling out value creatures to answer the board state is something many people forget that pod can do. Pay 1 mana and 2 life again (3 mana, 6 life) Sacrificing Felidar Guardian grabbing Karmic Guide , Trigger Karmic Guide to grab Felidar Guardian, Blink Pod again -Pay 1 mana and 2 life (4 mana and 8 life) Sacrifice Felidar Guardian to grab Kiki-Jiki Activate Kiki-Jiki to make copy of Karmic Guide returning Deceiver Exarch or Felidar Guardian untapping Kiki-Jiki. This line works exactly as above but is one step less and cost us 1 less mana and 2 less life! Activate Kiki-Jiki to make copy of Karmic Guide returning Deceiver Exarch or Felidar Guardian untapping Kiki-Jiki. Survival of the Fittest is Pod #2 in this deck. The Combo lines with Survival are a little mor convoluted, but survival can be used to tutor for Druid/Vizier simply, or just grab the creature answers we need. Survival is much more flexible of a card than Birthing Pod is. Turn Three (Second turn untapped): Activate Yisan (3) off of our mana dork we got on the second activation to grab Village Bell-Ringer which will now untap mana and Yisan. Activate Yisan (4) and grab Felidar Guardian which will blink Village Bell-Ringer. Activate Yisan (5) to grab Kiki-Jiki. Proceed to Kiki the table. I had always thought of this mutant lady to be a trap card in the list, but she is actually another 1 card enabler that just needs one untap turn to win the game. She goes off almost exactly the same as Pod, but without the mana or life lose. There are a couple cards that will be changed in this line tho. Start by sacrificing a 2 CMC creature and grab either Pestermite or Village Bell-Ringer, which will trigger and untap Prime Speaker Vannifar. This combo like Birthing Pod can win off any 3 CMC creature, just by grabbing the Hippocamp and proceeding down the chain. *NOTE: All of these enabled lines tend to end in the Kiki-Jiki combos. These line can be edited to end in another combo, but Kiki-Jiki is ultimately the most efficient win with this deck. In the introduction we discussed how we are a combo deck trapped inside a value tempo deck. There are several layers into the combo packages that lead to a value game plan. Yisan, the Wondering Bard: Is a creature combo enabler, but is often forgot he can just be used for straight value putting creatures into play. This line plays around counterspells and is often forgot about. We do not need to take the combo route with Yisan, and can often be seen tutoring out a Birds of Paradise or an Ethersworn Canonist . Prime Speaker Vannifar and Birthing Pod: typically these will be used straight for the win because of having one of these active and a 2 drop is typically game over, but we can also use these for value getting creatures into play. If I am stuck with park of the line in hand I can use the Pod lines to end into a Hate piece such as Linvala to wait it out another turn until the card in hand can be cast. Biomancer's Familiar / Training Grounds Both of these have the same affect and are redudant, but key in our value engine. Thrasios, himself, cost 4 to activate and is harder to pull off on his own, but with one of these in play 2 mana (or 1 with both) is super do-able and a major card engine. These cards not only work for Thrasios but also make Yisan cost 1 green to activate! Seedborn Muse : The only 5 CMC card in the deck that isn't involved in the combo lines and is asked why it is in the deck, but it is here for the Thrasios engine. Being able to untap our permanents each turn lets us both hold counters and activate Thrasisos numerous times before it is our turn again pulling us so far ahead. Using Pod or Neoform on a random Bruse Tarl into a Seedborn Muse makes the game swing heavily into our favor. This is probably one of the hardest parts of the deck to balance. Starting out building the deck we knew we wanted to play the Pod lines as the main focus of the deck, but how we supported it was the place we get stuck a little and often is the most changed and flexed section in the deck. Using stacks they typically do not play as well with counterspells. Affects like Sphere of Resistance Humility and Trinisphere are usually the best Stax pieces that could be played, but they will shut down what we are trying to accomplish. These are strong Stax pieces that can be played into our own game plan. Rule of Law and affects similar slow down our opponents and we can gain advatage with sources in Thrasios and Yisain. Linvala is a one sided humility that can be used as a beater. Stony Silence and Null Rod are some of the strongest and meta shaping hate. And Stranglehold and Aven Mindcensor are one sided tutor hate. Counterspells: Being on the tempo plan opens us up more and more to the advantage of playing counters. Dealing with threats before they even get to resolve is my favorite thing in magic. Playing counters on the tempo plan makes us a smaller target. We are not jamming game ending spells or massive threats like Ad Nauseam and can be less of a threat to the table overall until we pull off our game ending combos. In this list we try to fit in all the best and usual counters, others to consider are Mana Leak , Spell Pierce and the classic Counterspell . Budget: is one of the big things that can keep people off a deck and I complementary understand it. The great thing about this deck is that we can make it very budget friendly. Timetwister: This is the most expensive card in the list and probably the one people will have the most issue with, but that is not a problem. Memory's Journey is a budget option that gives us all the loops we could dream of, just as twister does. Force of Will/Mana Drain: Both of these are expensive are hard to get for some. Again no problem, counters such as Pact of Negation , Counterspell , Mana Leak , Spell Pierce and others are all great substitutions. Mana Crypt: Another "there's nothing rally like it" card. There are other mana rocks that can replace it, but it will not be the same. The best part of the deck is the main lines and combos are all fairly budget (under $10-$15 a card). There are also other routes the deck can be taken as well, but this is the optimal list at the moment. There are so many other packages and ways this deck can be taken into play. The route me and Lerker originally had come up with is different from I am now, and there are 3+ other ways we have discussed on discord as well. The deck itself is open to different lines of play. The original iteration had a wheel package (me and ShaperSavant had moved off of) that would use Wheel affects to try and gain advantage off of cards like Alms Collector and Smothering Tithe . This stratergy was super fun and hands would always be reset, but did not play well into Notion Thief metas. There have been takes on the deck that are less on Pod and on the focus of infinite mana. Infinite mana works wonder with Thrasios as he can turn colorless mana into our whole deck in hand. If going this route I would look at things like the Dramatic Reversal / Isochron Scepter and Druid/Vizer as well. This List can also have cool win-cons like Laboratory Maniac and Walking Ballista . There are several other options and would love to hear some thoughts as well on routes we can take in this deck!